Brian Noyes left 25 years of magazine art-direction (Smithsonian, House & Garden, The Washington Post) to launch a rural bakery in the Virginia Piedmont hunt country 50 miles west of Washington, DC. Trained at the Culinary Institute of America in Hyde Park, NY, and at L'Academie de Cuisine in Maryland, he bought a red 1954 Ford pickup from designer Tommy Hilfiger, renovated a 1921 Esso service station in Old Town Warrenton, Va., and threw open the Red Truck Bakery doors in August 2009 just as the economy started to plummet. Rave reviews by The New York Times, Garden & Gun, Southern Living and other publications turned this three-chef bakery into a small town coffee stop with a big online presence, sending out hundreds of orders nationwide each month. 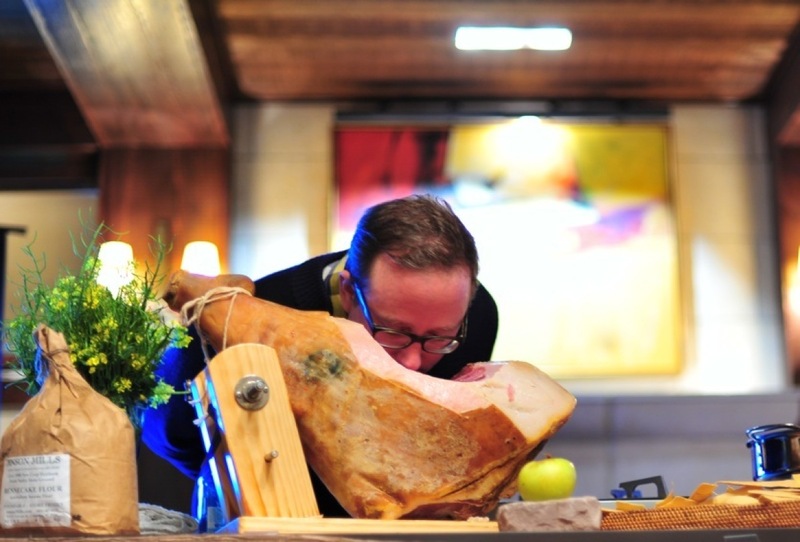 He lives in Arlington, Va., with his partner Dwight McNeill and has a farmhouse 20 minutes from the bakery in Orlean, Va. where he usually stays during the week. Two bakers, CIA graduate Kevin Powers and Ryan Glendenning from the Restaurant School in Philadelphia, round out the kitchen staff, with Nicole O'Brien on sandwiches and granola. After a slammed Thanksgiving week, my partner Dwight and I spend the weekend cleaning up the bakery and decorating it for Christmas. The bakery was closed Saturday to give the staff a break after a busy week, but online ordering and the American Express "Small Business Saturday" campaign (with our flat $5 shipping) gave us our best day ever -- without even opening our doors. 3:00am: Leave Arlington, Va., for the 45-minute freeway drive to Fauquier County. Thanksgiving completely wiped out our pantry; I stop at the 24-hour Harris-Teeter supermarket near the bakery for items to hold us over until our deliveries arrive. I see only one other customer in the grocery ghost town: the Inn at Little Washington's pastry sous chef Brett Gauthier, who lives near the bakery. He's limping with a broken toe after a kitchen accident the night before. I try to find someone to ring us up. 4:30am: At the bakery. Head baker Kevin Powers and assistant baker Ryan Glendenning have muffins and croissants in the oven. Our harvest wheat dough (with cranberries, golden raisins and walnuts) is on a mixer; Ryan's working on our double-chocolate moonshine cake (made with real Virginny hooch). Ordinarily I push one of the two bakers off my table so that I can start pies or quiches; today I'm at the computer until noon sorting through the 250 online orders that arrived over the weekend -- on any other Monday, there might just be a dozen or so. Complicating things: we just redesigned the website and there are plenty of goofs: people are ordering, getting error messages and then reordering, while the original order came through just fine. I print them all out and go back through the pile looking for duplicate orders and after receiving some changes ("I forgot to add a greeting!"). Ryan takes over the cakes and cranks out bourbon cakes, triple-chocolate cakes, apple cakes and rum cakes. Kevin's chopping vegetables for his Caldo Verde soup; he's a magician with a stockpot. For a Monday, the place is smokin'. Noon: Sending relentless emails to our website designers begging for emergency tweaks; the duplicate orders and error messages continue. I have a pile of baked goods that need to ship today; I print out the UPS airbills, send the customer a note saying it's going out the door, and handwrite either a note to the orderer or a gift card to the recipient. Ryan texts us to let us know that she hit her second deer on the way home. 3:00pm: I finally put on an apron and make mincemeat for our pies; many ship tomorrow. I used to import British suet for the mincemeat but now our friends Derek and Amanda Luhowiak have opened The Whole Ox butcher shop nearby and trade the suet for baked goods. Last December, Esquire magazine wrote about my one-man campaign to resurrect authentic mincemeat pie; lots of orders come in for pies for dads and grandads. The praise arrives later. 4:00pm: Mad dash to the state-run ABC store for booze: brandy for mincemeat; rum and bourbon for those cakes. Elsewhere I pick up a case of moonshine. 4:50pm: Pies in oven. I remember next weekend's Christmas parade in Rappahannock County, in which we'll be a part, and yank out our red 1954 Ford F-100 's 6-volt dead battery and high-tail it to the Firestone dealer before they close; it's on the charger for the night. 7:10pm: Home at the farmhouse and do three loads of laundry. Pick the last of the persimmons by flashlight; I'll use them in cookies (my grandmother's recipe) at the bakery. In bed by 8 pm; up at 2 am. 2:00am: After years of working normal hours in magazine publishing, I thought I finally had this early-morning bakery thing down. But today it's all going wrong. In the shower I used the hair conditioner instead of face soap, got locked out of the house while warming up the car, and tried to unjam the zipper on the pants I'm wearing with a steak knife -- I knew that couldn't end well. 4:00am: The drive from the farm to the bakery is usually 20 minutes but in deer-rutting season it's literally murder to go over 35 mph on the backroads. 6:00am: UPS airbills printed for the day's orders; a much-more manageable amount of orders need to be shipped. But my luck doesn't hold out: the color printer dies, which means we can't print labels for our in-store and shipped goods. Staples doesn't open until 8am. 7:00am: The chilly morning turns into a crappy rainy day, which just kills sales at the bakery. Although we're adjacent to the courthouse, library and county offices, if it's raining the locals don't venture from their desks. Undaunted, the kitchen crew finishes up the breakfast baking -- what's left over at the end of the day can be sold day-old tomorrow or taken to the local food bank. 8:00am: Nicole arrives to make sandwiches. Local farmers sell us poultry; we roast the chickens here and make a great chunky chicken salad sandwich with grapes, apples, walnuts and a hint of curry. The eggs are local, too, and we use them in our egg salad and all of our baking (love those orange yolks!). Tuna, roasted veggies and meatloaf round out the sandwich offerings: it's all grab-and-go; we have them in the fridge up front by 11 am. I'm at Staples when it opens; I buy a new color printer, wrestle it in and out of the car, set it up and get the labels printed. 8:30am: Oops, never underestimate your customers -- even in the rain, in comes a crowd. And they're squatters: it's a big group of loyal online customers who drove up from Florida; they wanted to visit the Red Truck Bakery for the first time and are meeting other relatives here, eating for hours. 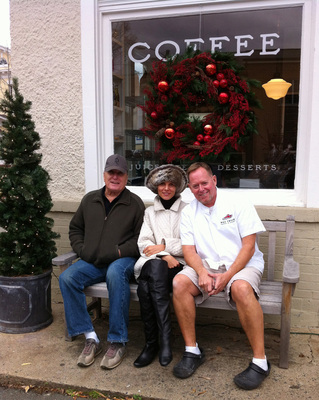 They tour the shops of Old Town and come back again for lunch. We love 'em. 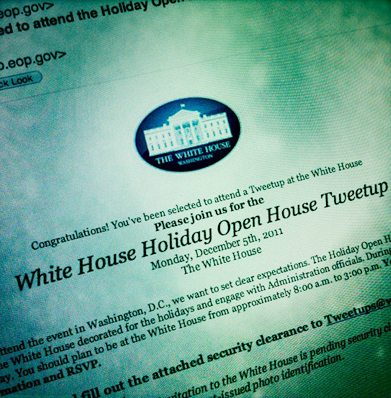 10:00am: After entering a Twitter competition, I get an email inviting me and Dwight to the White House next Monday for a holiday tour and morning round-table discussion "with administration officials," including the White House pastry chef. It's a day-long affair and one I'd hate to miss: can I afford to go in the middle of Christmas baking and shipping? 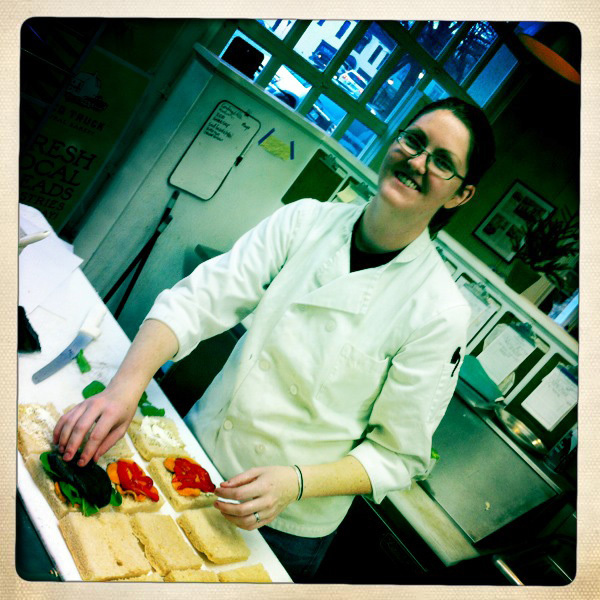 11:00am: In addition to the regular load, Nicole finishes making and wrapping 30 extra sandwiches for Highland School, a private upscale institution with, remarkably, no cafeteria. The woman who placed the order arrives and says she wanted boxed lunches -- so we race around to package these up, add chips, apples, water and cookies. She later realizes she never exactly said box lunches when ordering, but we're happy to help. 11:30am: A timid request lands a deal: The landlady offers up vacant space two doors down if we need it for shipping our packages. She's a God-send; last year we had to close the dining room so that we could use the communal table for packaging. "We'll take it!" Even better: it's free! 12:30pm: In comes actor Robert Duvall and his wife Luciana. 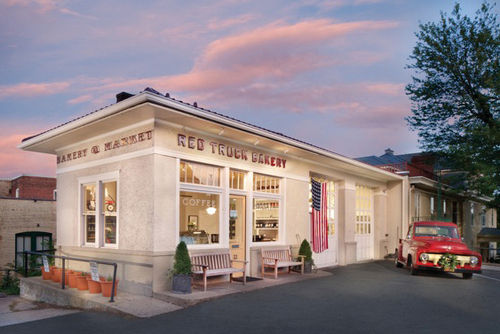 They're neighbors with a large farm up the road and are good customers at the Red Truck Bakery. Most customers recognize him right off and ask him about movies. I tell 'em later: if you really want to start a conversation, talk about beef. Duvall knows the best steakhouses anywhere. You name a town, he knows the meat. "Tampa? Yeah, yeah -- great steaks at Bern's." 2:00pm: Truck's battery needs replacing; ordered a new one: "But it needs to be here by this weekend's parade." 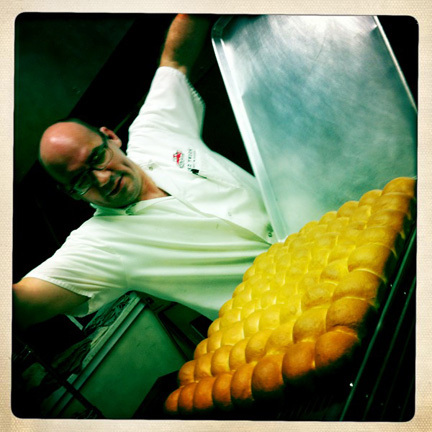 They want a loaf of our focaccia to grease their palms. Done deal. 3pm: I'm back in the kitchen baking quiches, apple cakes, triple chocolate cakes and sweet potato/pecan pies. 4pm: More ordering errors; another round of wrangling for website fixes. I'm promised that it's done and goof-proof. We'll see. Email from England: a woman wants a pie baked and delivered to Los Angeles by tomorrow morning. This one is hard to explain to her. 5:30pm: We flip the "open" sign around and everything that's come out of the oven this afternoon needs to be wrapped by the store closers. They're never really thrilled about cleaning up after the bakers, but they know no one else is around to do it. 6pm: At the farmhouse. Into bed after Brian Williams finishes the news. Set the alarm for 1:30am. 5:00am: I make a bank deposit through the after-hours depository and leave a box of pastries at the door for the Oak View National Bank gang -- this small-town bank was a big help getting me started. Florian Dengel arrives with his eggs and chickens; he and his cousin Timm have a new farm; we're their first customers. 5:30am: Veronique arrives to open the store. She's a pro with a sense of style: presentation always is stellar when Veronique's on duty. She starts complaining about the dirty baseboards and walls in the retail space. I fire off an email to the cleaning crew supposedly doing the job: we're promised a thorough scrubbing tonight. 7:00am: Regular routine in the kitchen; everyone knows what needs to be done and gets it baked. We're all a little overwhelmed; not fully recovered from the Thanksgiving frenzy, we're now thrown into an escalating Christmas bake. Dozens of orders are now shipped everyday; we're handling that plus the accelerated orders out front. In the kitchen: Three pros and -- finally -- a dishwasher who is trouble-free. We've had nine dishwashers since we opened two years ago; I began to think every dishwasher first had to make a stop in jail before showing up here with an application (one of them, after calling me up to say he was being detained, told me the cell he was in was really small: "I usually get a larger one"). Rosso is a self-starter, and looks for things to keep busy: "I'll do that for you" he says. 1:00pm: A couple from out of town comes in for pastries, and tells us their son told them to stop by "because Robert Duvall eats there." Seconds later, in walk the Duvalls with a woman who owns a local horse arena; they grab some lunch and he chats about films with the couple. Luciana Duvall and her assistant Daisy give us their Christmas gift list to fill, we'll be shipping items to their actor friends, including James Caan, and to Duvall family members. Last year they assembled a gift box of our harvest wheat bread, coffee cake, granola and bag of coffee and asked that we send that as their gifts. We've since christened the collection "Bobby's Breakfast-in-a-Box" and put it on our website, giving them full credit for the idea. I give ten bucks from each purchase to the Robert Duvall Children's Fund. 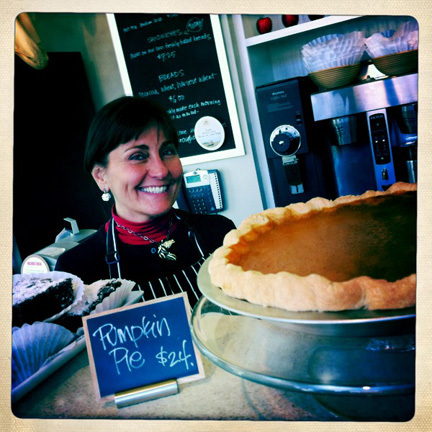 Noon: Orders for our sweet potato/pecan pie, honored in Garden & Gun magazine, are swamping us. I worry about shipping them; we've had some accidents in the past where the slightly-fluid pie slops over when mishandled during shipment, and have had to make refunds. I remove them from the website. 1:00pm: Store manager Jim Summers is taken out of the front-of-the-house to help make the last of the fruitcakes. I learned to make these while in Cuba; they're full of fruit, nuts and lots of rum. 3:00pm: I get another 38 baked sweet potato pies into the freezer; UPS suggests shipping them frozen and sent Second Day Air with a freezer pack; we're doing it. 3:45pm: After taking it off the website, I start getting phone calls from people frantic to order the sweet potato/pecan pie: "I saw it in Garden & Gun! We want it!" A woman from Texas calls up to say the same thing. They're desperate for something they didn't know existed a week ago; it always amazes me that we can tell people to what to order and they do. 3:00am: Ryan calls me from the bakery; she can't get the lock on the basement pantry door opened -- it's where our freezers are located. "Did you change the combination?" Nope. She earlier called head baker Kevin, who's off today and just in bed after bar darts. He charges in and can't open it, either. Over the phone, I suggest using the tire iron from his vehicle. "But don't kick in the doors!" 3:45am: I'm in my vehicle racing in to help, and I get pulled over for going 70 mph in a 45 mph zone. The trooper looks at me and says "Brian?" He's a regular at the bakery; I tell him my pastry girl is locked out: "No doughnuts!" He responds with four words: "Watch for deer. Go!" 4:00am: The tire iron works and Kevin's back home trying to get to sleep. 6:00am: We get the breakfast pastries out quickly; Ryan really hustled to catch up. No one out front was the wiser. 7:00am: Killer sunrise. It's one of the few benefits of being up so early; this one is so stellar that I post a photo on our Facebook page. I try to get something topical on there everyday; I've had a lot more luck with a bakery Facebook page then trying to tweet what's out of the oven. 7:15am: Looking for pecans for our pies and fruitcakes and realize we're down to one case. I call Lentz Milling, our bakery supplier, and find our back-ordered pecans are sitting there waiting for us. They overnight them instead of saving them for next week's delivery. It sure helps to have a good relationship with the vendors (and the head of the company being my former next-door-neighbor doesn't hurt). 1:00pm: I leave the bakery for an appointment in Rappahannock County, fertile farmland to the west of us hugging the Blue Ridge Mountains and the Shenandoah Valley, and the home of the revered Inn at Little Washington. I'm looking for another location for the bakery and have early backing from some businessmen out there. We spend three hours going over Excel spreadsheets to see if it's feasible; things are looking pretty good. 5:00pm: Back to Warrenton and the ABC store for more booze for the cakes; Ryan will need it to get started in the morning. I get a call from a woman in Texas wanting to order 78 moonshine cakes for clients, and an email from Williams-Sonoma wanting to feature our products in their stores (since they tell us they need numerous samples in San Francisco in one day, I ask them to wait until January). I check email and find an invitation for Dwight and me to see a screening of the film "J. Edgar" (partially filmed in Warrenton near our bakery) at Robert Duvall's house in two weeks; we clear the calendar for that. Before I leave, I grab the leaf blower from my vehicle and clear the lot of leaves. 4:00am: Raccoons are everywhere this morning. I slam on the brakes and send a case of rum flying onto the floorboards -- nothing broken. I start worrying about getting everything done before the holidays. Orders are coming in like crazy and we're just three bakers. I make a list of everything that needs to be ordered: boxes, labels, packaging materials for the Christmas onslaught. Kevin's on top of kitchen ingredient needs; he's got the pantry and fridge organized. I hang our "Voted Best Bakery in Warrenton" banner across the front of the bakery's former service bay windows for the weekend. The town has sent me threatening letters about doing that; we're in a historic district and it's against the rules. But we're also in the middle of a crappy economy and I'm trying to run a business. 10:00am: Kevin, who's been here all night, is trying to get out of here for the weekend -- it's his family's annual pierogi-making party in New Jersey. It drives me crazy that he's leaving us alone on a Saturday with a Christmas parade outside our door, but I know he's able to get all his work, and most of mine, done before he splits. 2:00pm: A mobile auto-wash and detailing company arrives to buff out the old red truck. Built in 1954, I bought the truck from Tommy Hilfiger, who kept it on his Connecticut farm. It was in great physical condition but has suffered sitting outside the bakery. Kids climb on it, families pose for photos, car doors nick the doors, and the intense sun does a number on the red paint. My wash guy brings it back to life with a beautiful deep wax and buff -- it's gorgeous and ready for Sunday's parade in Little Washington. He takes a photo to send back to his brother in Jamaica ("We had a old truck like it to tow the cows around"). I organize the next week's shipping and get pies made for the Saturday crowd. A woman calls to order 25 pies for a Realtor party. 1:00am: Parade day in Old Town Warrenton. We're not taking part in this one; no need, with the parade coming right past the bakery. I flip the lights and ovens on; I'm rarely the first one in but today need to get a jump-start with Kevin away. I organize the day's orders and start some pies and apple cakes; Ryan is in at 3am to start the pastries. 6:45am: Waiting for our dairy delivery; I called the day before to alert them to parade road closures -- if they weren't here by 6:30am, they couldn't get near the place. Street roadblocks go up 15 minutes before 7am, the designated hour, and THREE HOURS before the parade starts. 7:15am: A guy in his seventies drags into the bakery and complains about being forced to walk three blocks in the dark and cold due to roadblocks. We hear that all morning: the business district is sealed off from the town and no one can enter by vehicle. And those that do make the trek on foot are astounded to see blocks of available parking inside the area -- and none of them can believe it's for a parade that doesn't start until 10am. I fire off an email to the mayor, police chief and the town manager; I complained about it last year hoping they would rethink this. A police sergeant arrives and attempts to explain. The mayor says he'll look into it. 8:00am: Nicole arrives; I'm a bit stern with her about taking yesterday off without making granola. It's got a big loyal following and customers are not happy if they come in and don't find it. We always get a good amount of online orders, but one day last month they started coming in like crazy. A quick Google search turned up an interview with The Travel Channel's Andrew Zimmern saying he eats for breakfast "Greek yogurt with Red Truck Bakery granola, the best granola in North America." Nicole cranks out a huge batch. 10:00am: The parade kicks off; our parking lot is empty. Grand Marshall Willard Scott of the Today Show, a local resident, rides by first. I run a gift bag through the crowd and right up to his car, handing him a loaf of bread, an apple cake, our granola and some coffee. The crowd laughs and applauds; Willard looks at me, confused. "It's from our bakery" I say, gesturing over my shoulder to the building. "Oh, heh heh heh!" 2:00pm: Lots of traffic into the store but it's mostly hot chocolate and small stuff for kids. The restroom's a mess. A dead afternoon. 4:00pm: I race home to Arlington for a quick nap, then Dwight and I are off to the Kennedy Center to see Merce Cunningham's legacy dance tour; one bit of culture and time together. First, though, a stop at the ABC store for more booze for the cakes; a local whiskey distiller is handing out samples inside the store. Boy, that hit the spot. 8:00am: I drive back in from Arlington. Today's the parade I'm excited about: "Christmas in Little Washington." I first stop to get four bushels of apples from Chester Hess, our local apple grower, then head to the bakery to fire up the old red truck. I haven't driven it in a year so I've been nervous; with the new battery it starts right up. With exhaust spewing, I muscle it to the gas station to fill the tank and inflate the tires. 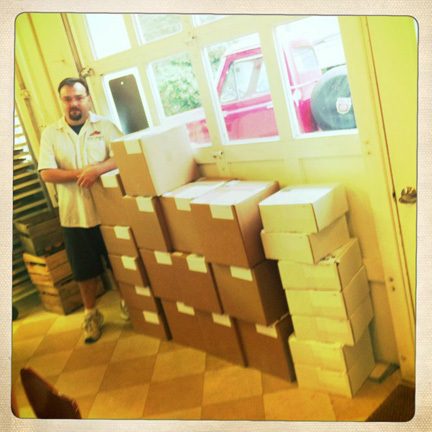 Jim's in the bakery prepping shipping orders for Monday. 11:00am: Dwight arrives from Arlington; we drive the 20 miles to the village of Washington, Virginia and line up for the parade. Co-worker Janis Golden is there with six-year-old son Sean to pull the wagon with the bakery sign; our favorite customers Susan and Allen Taft are there for moral support and, with Dwight, will hand out Kevin's candy-cane brownies to the crowd. In the waiting area I greet Patrick O'Connell, the Inn at Little Washington's owner and big cheese, and he wonders when I'm opening the Red Truck Bakery in his town. "I'd love to be here," I tell him with a smile. 1:00pm: The parade starts up; Dwight's not happy that we're following a large camel. We all wind our way through the crowds of this little one-stop-sign village. Thanks to the Inn and the town's location in the Rappahannock farmland, it attracts the food-savvy crowd and DC folks who want a country weekend home. 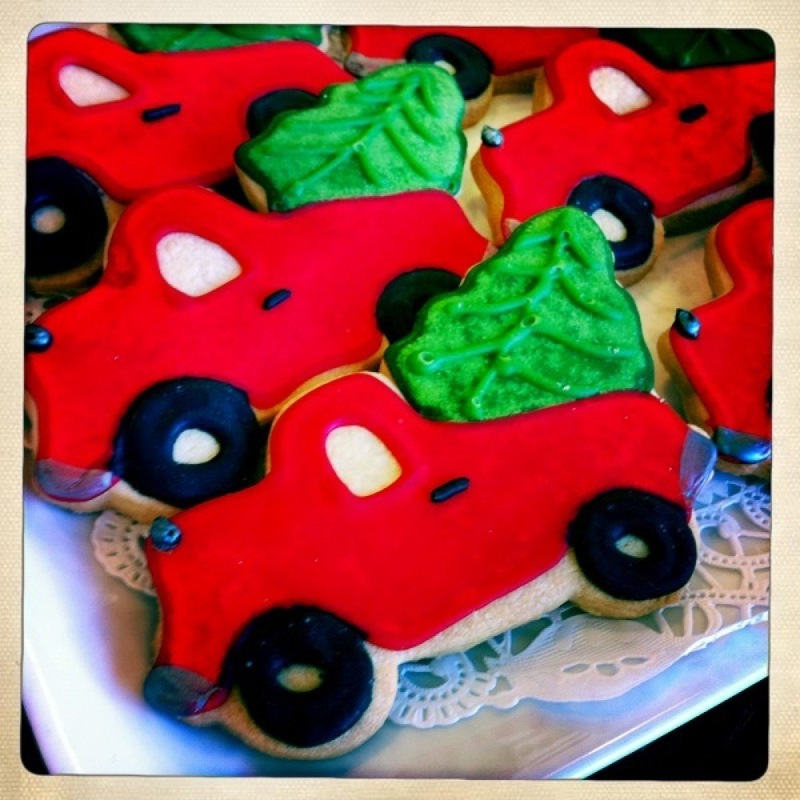 I'm amazed by the crowd's reaction: they adore the red truck and, it becomes obvious, the Red Truck. 2:00pm: The truck's back at the bakery and Dwight and I are heading out to the farmhouse. First, though, I send an email to tomorrow's White House open house sponsors to turn down the invitation for the tour and meetings. I left Washington, DC behind to concentrate on getting a rural bakery launched, and I need to focus on it as we head into our busiest season. There's no place I'd rather be.